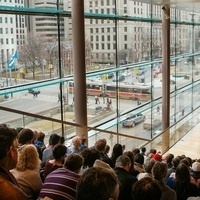 Celebrate the 1,000th performance of the Free Concert Series with renowned British soprano Susan Bullock (Klytämnestra in the COC’s Elektra), who made waves in Toronto when she performed the role of Brünnhilde in the first complete Ring Cycle by the COC to open the Four Seasons Centre. Her return to the COC in the title role in Elektra in 2007 earned her a Dora Award for Outstanding Performance in the Opera Division. She is joined by Head of the COC Ensemble Studio, Liz Upchurch, for an electrifying program featuring composers that include Wagner, Duparc, and Strauss.